I love to cook for others. 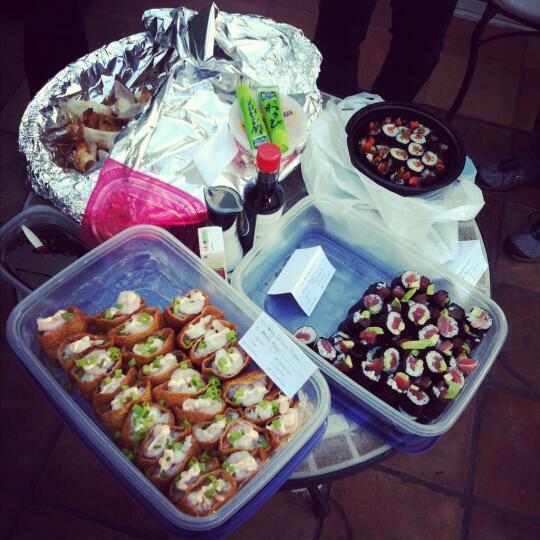 Like, really, really love making sushi for other people. In a perfect world, I’d be allowed to experiment and have as much freedom coming up with new rolls as I do here on Sushi Day. But this isn’t a perfect world, and not everyone will eat all the random rolls I put together (and, to be honest, not everything I attempt comes out well…). And I’m okay with that. Then there are those with allergies – gluten-free? Just stay away from tempura. (And bring some wheat-free tamari soy sauce… did you know that most normal soy sauce actually has wheat products in it?) Dairy-free? Okay, no rolls with cream-cheese. And, of course, you have those with other dietary restrictions, like vegetarians and vegans. At the most recent potluck I went to, I knew we’d have a few vegetarian/vegan attendees. So in addition to the other sushi dishes that I brought, I decided to come up with a vegetarian roll. Obviously, I was going to use primarily vegetables in the roll. I considered using tofu, but decided against it since I didn’t think there would be a quick, easy way to make tofu taste good in sushi. (I needed something that wouldn’t be too time-consuming, since I was making four dishes that morning for the potluck.) I also couldn’t resort to tempura-frying the veggies, since tempura isn’t vegan – the batter uses egg. For the same reason, no mayonnaise is allowed either. But it had to be a delicious, somehow interesting roll. It just wouldn’t be right to make delicious rolls for my meat-eating friends, and then bring a boring, “blah” roll for my vegan friends. So I had to come up with something so good even the meat-eaters would love it. Toss the asparagus with 1 tbsp olive oil and the salt. Spread out on a baking sheet. Toss the carrot sticks with the maple syrup and remaining olive oil. Spread out on a separate baking sheet. Roast the asparagus and carrots until the asparagus starts to brown, about 1 hour. Deep fry the onion slices in the canola oil until crispy. Drain on paper towels; sprinkle with salt. 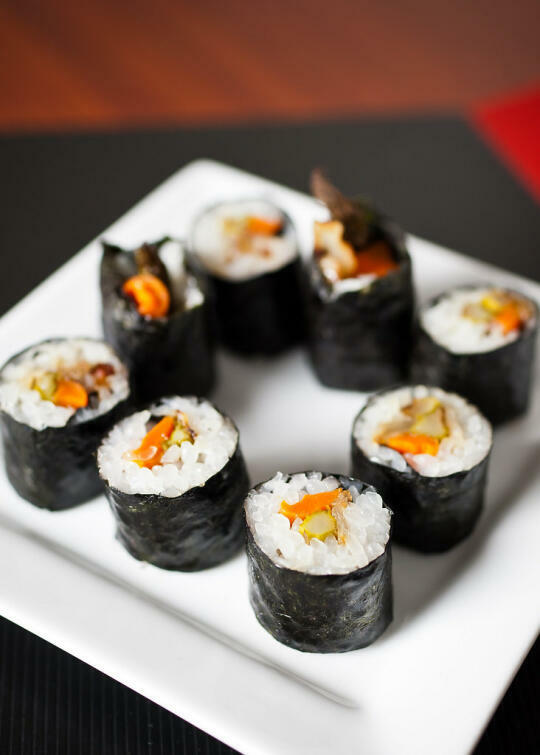 Roll the sushi, using the roasted asparagus, maple-roasted carrots, and fried onions for your fillings. I agree with you about the many considerations you have to make when you bring food to a potluck. These days, I print out a copy of the recipe to slip under or put beside a dish so I don’t have to explain EVERY TIME what is in there. Lara – Aw, thanks! 😀 Yeah, I do the same thing… I try to list out the ingredients for every roll, so anyone with allergies or dietary restrictions knows what they can and can’t eat. 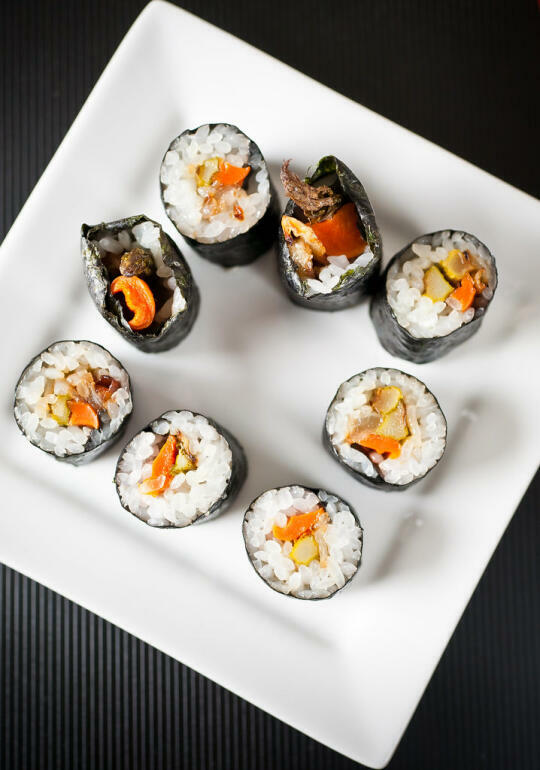 Thanks for this – I’ve not made vegan sushi before because I could never think of anything more interesting than cucumber to put in the rolls, but these sound good, particularly the maple syrup carrots. I’m all for vegan sushi. Let’s give fish a break. They are overcaught. Great article on Vegan sushi. I like the simple ingridients. Now I know in detail on what to use for sushi for certain people, especially for those gluten free and Vegans. Great article on Vegan sushi. I like the simple ingredients. Now I know in detail on what to use for sushi for certain people, especially for those gluten free and Vegans. I love it, this is perfect for people on a diet. This is a great recipe with simple ingredients. Thank you for this one.